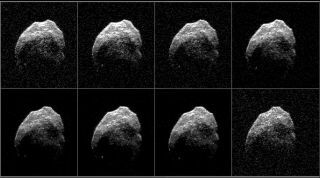 These eight individual radar images of asteroid 2015 TB145 were captured on Oct. 31, 2015 using NASA’s DSS-14 antenna in Goldstone, California and the Green Bank Telescope in West Virginia. New photos show the less spooky side of the big asteroid that flew past Earth on Halloween. The 2,000-foot-wide (600 meters) asteroid 2015 TB145 looked startlingly like a giant skull in radar images captured by Puerto Rico's Arecibo Observatory on Oct. 30. But the space rock is not so haunting in newly released photos taken on Oct. 31, when 2015 TB145 cruised within 300,000 miles (480,000 kilometers) of Earth — about 1.3 times the distance from our planet to the moon. "The images look distinctly different from the Arecibo radar images obtained on Oct. 30 and are probably the result of seeing the asteroid from a different perspective in its three-hour rotation period," Lance Benner, of NASA's Jet Propulsion Laboratory in Pasadena, California, said in a statement Tuesday (Nov. 3). "The radar images of asteroid 2015 TB145 show portions of the surface not seen previously and reveal pronounced concavities, bright spots that might be boulders and other complex features that could be ridges," added Benner, who leads NASA's asteroid radar research program. Scientists took the new images using a 230-foot-wide (70 m) radar dish at NASA's Goldstone Deep Space Communications Complex in California and the 330-foot (100 m) Green Bank Telescope in West Virginia, which is operated by the National Radio Astronomy Observatory. The researchers beamed microwaves at 2015 TB145, which researchers suspect may be a dead comet, using the Goldstone antenna, then collected the radar "echoes" using the Green Bank dish. The resulting photos feature a resolution as fine as 13 feet (4 m) per pixel, NASA officials said. Researchers had eagerly anticipated the Halloween flyby, which marked the closest known approach of such a large space rock until August 2027. 2015 TB145 itself won't be in Earth's neck of the woods again until September 2018, when the asteroid — which was discovered just three weeks ago, on Oct. 10 — comes within about 24 million miles (38 million km) of our planet, NASA officials said.